Nandyal is known for the Nava Nandis i.e. 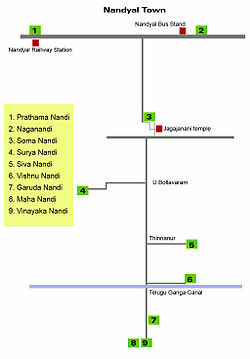 Nine temples of Lord Shiva including the biggest and widest temple of Lord Shiva of Andhra Pradesh – Maha Nandi, Shiva Nandi, Prathama Nandi, Naga Nandi , Garuda Nandi, Surya Nandi, Krishna Nandi, Vinayaka Nandi and Soma Nandi. Everyone who visits Nandyal takes a tour of these Nava Nandis at first. Although completing the tour of Nava Nandi in one day is a tough task, but it can be done in a day with some simple steps by following the route map give here. If you start at 6:00 AM in the morning, it is possible to complete the tour within half day. Let us take a look at the route to complete the tour. Sakshi Ganapathi Darshanam - Before visiting the Nava Nandis, one must visit Sakshi Ganapathi situated at Chandrasekhara Swami Temple (Ayyappa Swami Temple) in Gudipatigadda. Prathama Nandi - After visiting Sakshi Ganapathi, one must go to Prathama Nandi Temple, The first Nava Nandi of your journey. The temple is located near Chama Kalva. Naga Nandi - From Prathama Nandi, you must go to the Naga Nandi, which is situated in the main temple of Sri Anjaneya temple of Nandyal. This temple is located near the bus stand. Soma Nandi - Soma Nandi temple is the fourth location of your journey. The temple is situated at very close to Atmakur bus stand. It is believed that by darshan of this Nandi, devotees are blessed and protected by the Lord Shiva in the Krishna Paksha or Shukla Paksha. Brahma Nandi - Your next destination should be the Brahma Nandi temple, which is located at a distance of around 13 Km from Nandyal in Kadamala village. Krishna Nandi - Krishna Nandi is located in the deep forest area of Nallamalla ranges and is the next step in our tour. Maha Nandi - It is the most famous temple of all Nava Nandis. The temple is also located in the deep forest area of Nallamalla ranges at around 15 Km from the city of Nandyal. It is the biggest and widest Siva temple in whole Andhra Pradesh. Vinayaka Nandi - When you exit from Mahanandi, you will find the Vinayaka Nandi situated in the same premises. Garuda Nandi - Garuda Nandi is also located in the same premises of Mahanandi. You can find this place straight opposite to the entrance of Mahanandi Temple. Surya Nandi - Last Mahanandi of Nava Nandi Tour is located in the village Thamadapalli on Mahanandi - Nandyal Road. Although the visit of Nava Nandis is finished at Surya Nandi temple, but all of the devotees must report about their safe tour of Nava Nandi Darshan at Sakshi Ganpathi again, as the same is compulsory for every person to complete and fulfill this journey.